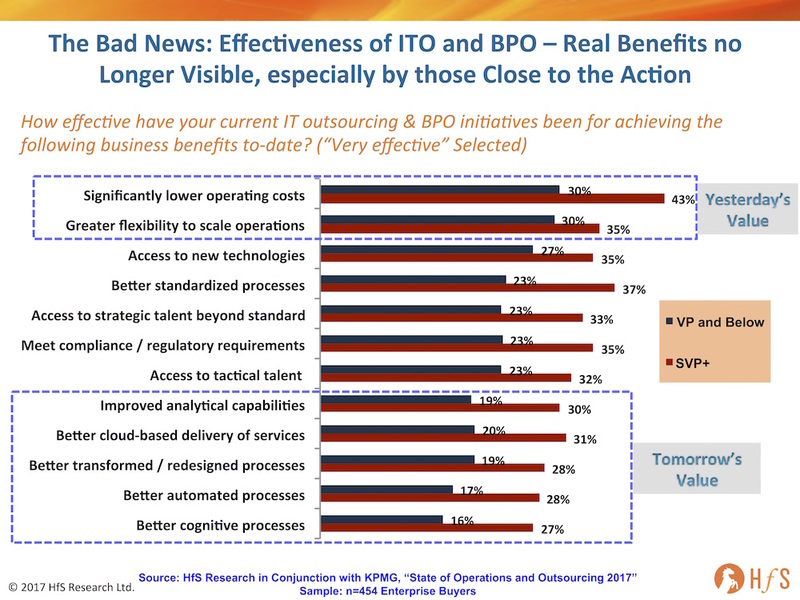 If there was ever one home-banker benefit from outsourcing, it was always the ability to take 30%+ off the bottom line cost of running a process or set of processes. The VPs and below are those who are managing the engagements – and not even a third of them view their engagements as being very effective at driving out significant cost or making their operations more flexible and scalable. Their bosses are slightly less cynical, but still the vast majority is underwhelmed. Well, the answer is quite simply that those costs have been removed from the balance sheet – they no longer exist. Managing operations in a global environment is now the new normal – money that was saved was a onetime experience in the past. It’s like trading in your Hummer for a Prius… you don’t think to yourself, everytime you fill up with gas, “Wow, I’m saving $50 per tank”, but you might even think, “Hmmm… maybe I’ll get a fully electric car next and save even more on my running costs”. We can go on to bemoan the disappointing lack of effectiveness from analytics, automation and cognitive from over four-fifths of outsourcing engagements, but we know clients are unlikely to have invested actual funds in these areas as part of most of these engagements today – they are getting what they have paid for in the past. 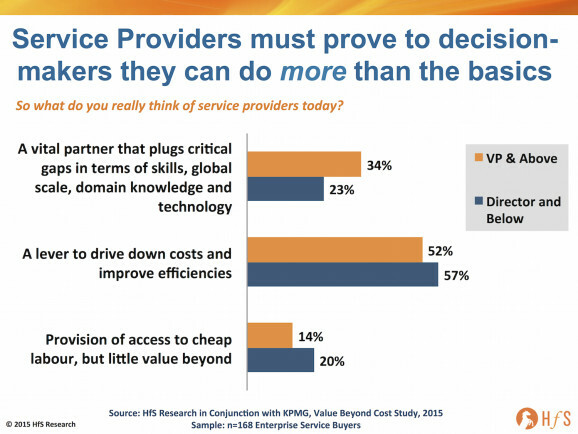 What’s encouraging here is that buyers, by and large, do not view their service providers as mere efficient cost take-out vehicles, which was how well over half viewed them a couple of years ago. 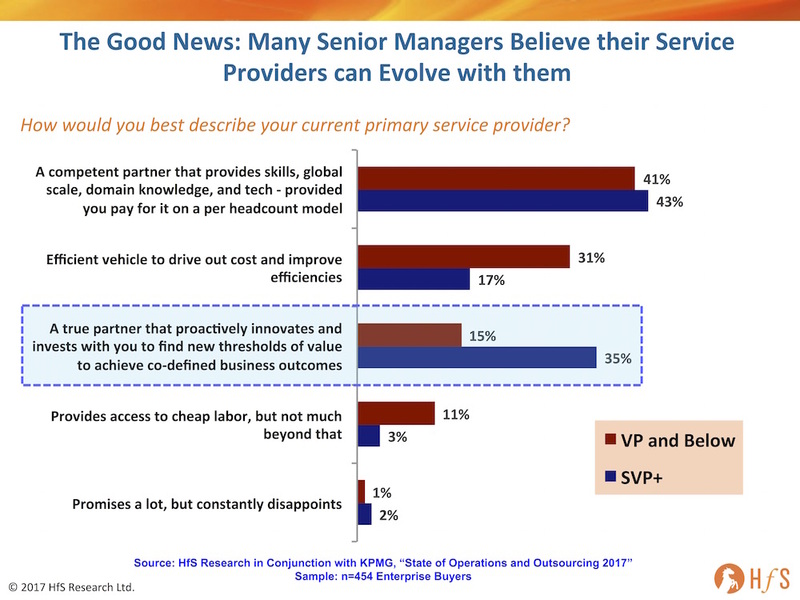 While 43% of SVPs and above see service providers as competent partners who can deliver the goods, another 35% actually view them as real innovation partners who can work with them to achieve co-defined business outcomes. This is a breakthrough for the services industry.